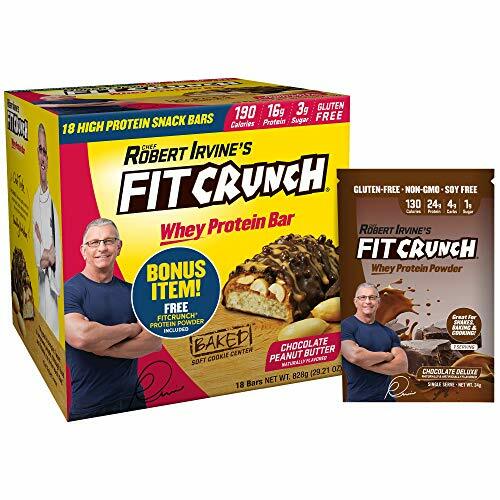 - CHOCOLATE PEANUT BUTTER: The award-winning FITCRUNCH Peanut Butter Baked Bar is arguably the best protein bar ever made…EVER. The classic candy bar combination of peanut butter and chocolate stops cravings in their tracks, while delivering quality whey protein isolate with just 3g of sugar. Some call it a Living Legend. - WHEY PROTEIN: Our protein bars are made from a unique protein blend (Whey Protein Isolate, Whey Protein Concentrate). This is ultimately the best quality protein available on the market. - 6 LAYER BAKED BAR: We have the worlds first 6 layer baked bar! Most protein bars have just one layer, ours stands out with 6 layers that all play an important part in our award winning protein bar appearance and taste!